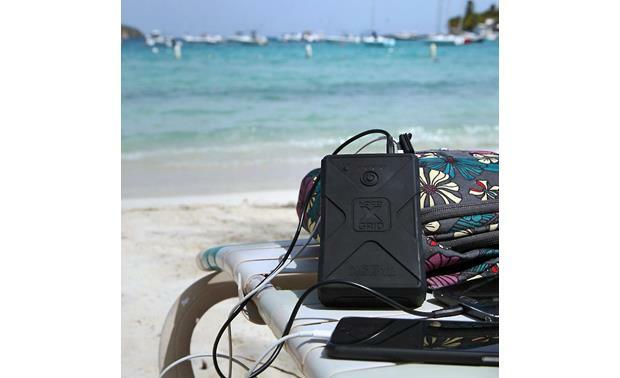 When you need to recharge your 12-volt portable devices, it helps to have a handy power source. When you need to recharge your 12-volt portable devices, it helps to have a handy power source. 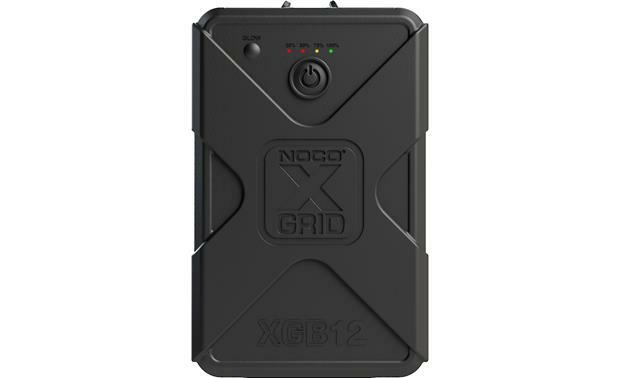 NOCO's XGrid XGB12 portable charger and power pack will charge your mobile and USB devices. The 12,000mAh lithium-ion battery stores enough power to charge your smartphone up to five times, and its dual USB ports allow you to charge multiple devices simultaneously. The charger's integrated glow light helps you see what you're doing when hooking up to the charger in the dark. It also features an XGC port that allows you to plug into NOCO's XGS4 and XGS9 portable solar panels (available from NOCO). 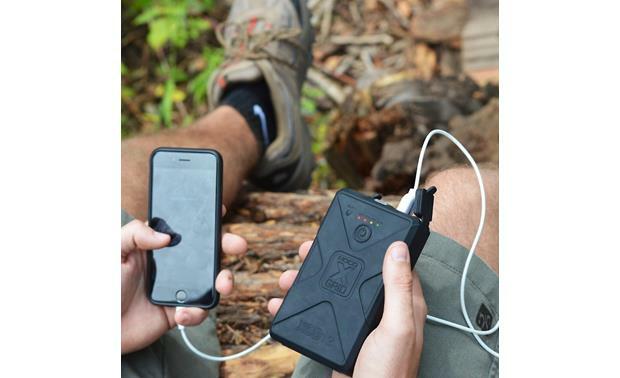 The XGB12's rubberized outer layer repels moisture and protects the charger from damage if you drop it. Its housing has an IP65 rating for dust and water resistance, so it'll stand up to the elements when you take your XGB12 off the beaten path. 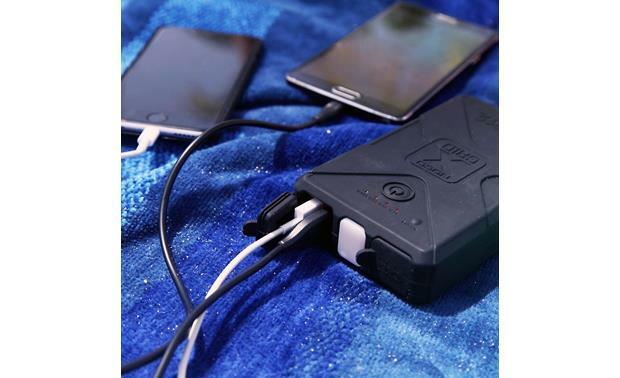 Whether you're driving, out camping, or just going for a walk, this small, lightweight portable charger will go anywhere you want to go. Product is well built and heavy. Takes a long time to charge a phone though. Waterproof Portable Charger: The Noco XGrid XGB12 is an ultra-compact external portable charger and power bank for recharging mobile and USB devices. Its impact and water resistant rubberized outer layer handle the abuse of the most extreme environments - water, dirt, dust and more. 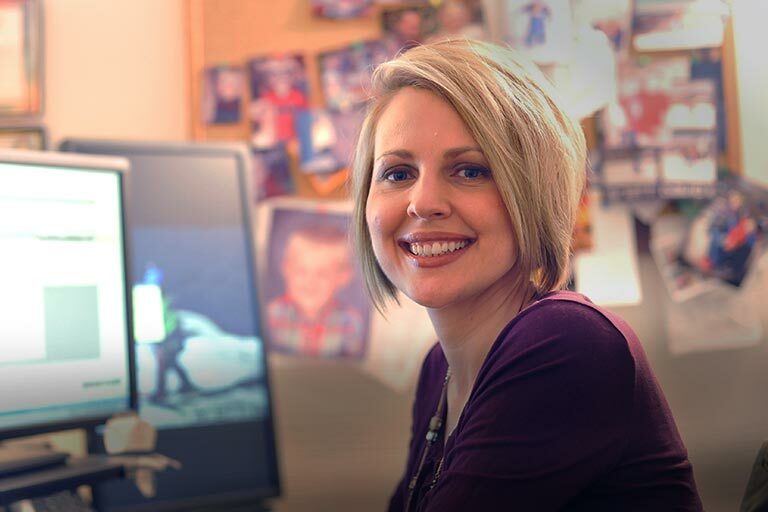 With 12,000 milliamp-hours of reserve battery power, you can keep your devices fully charged and ready to go. Device Compatibility: The Noco XGrid XGB12 is compatible with most USB rechargeable devices - like smartphones & tablets (including iPhone & Android), eReaders (including Kindle), HD action cameras (including GoPro), Bluetooth speakers & headphones (including Beats), smart-watches (including Apple Watch & Fitbit), portable GPS navigators (including Garmin), two-way radios, & more. Rechargeable Battery: Designed with a high-density lithium-ion battery (12,000mAH / 44Wh), the XGB12 is rechargeable from any USB power source (USB/AC power adapter, 12V car charger, computer/laptop, or solar panel). It provides 60-hours of additional talk-time and 400-hours of audio playback, plus recharges most USB device multiple times. The number of times you can recharge a USB device will vary from brand-to-brand and device-to-device. For reference purposes only, below are the estimated number of recharges per device (actual results may vary). USB Connectivity: The Noco XGrid XGB12 is outfitted with two full-size USB (type-A) ports and a microUSB (type-B) port, all rated at 5V/2.1A. A 40" microUSB-to-USB cable is included. Dual USB Outputs: The dual full-size USB (type-A) ports serve as a connection to up to two USB mobile devices (like your smartphone & tablet, Bluetooth headphones & speakers, etc) to charge the your devices' batteries at the same time. microUSB Input: The Noco XGrid XGB12's microUSB (type-B) port serves as a connection to a USB power source (like a computer/laptop, USB/AC power adapter, or 12V car charger) to charge the built-in lithium-on battery. 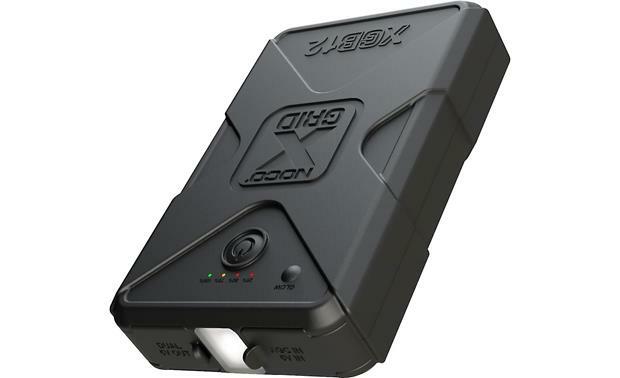 Solar Input: The proprietary XGC input (5V/2.1A) allows for recharging directly from Noco's XGS4 and XGS9 portable solar panels (sold separately). 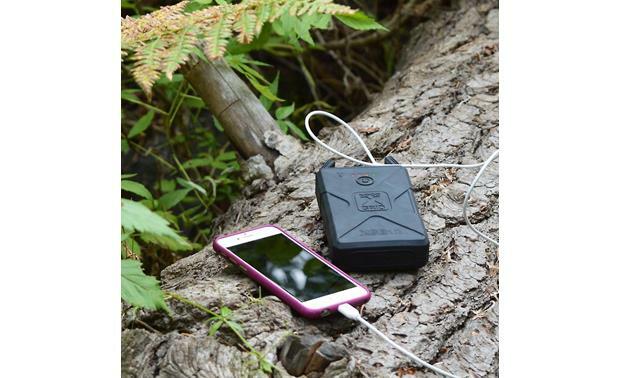 Pass-Through Technology: The XGrid XGB12 includes Pass-Through Technology, which allows you to recharge your mobile devices' batteries and the XGB12's battery at the same time. Its also designed to not overcharge your devices. LED Indicators: Four LED indicators display charging status & current battery life. The LEDs will blink during charging and turn solid to indicate battery life (4 LEDS = 100%, 3 LEDS = 75%, 2 LEDs = 50%, 1 LED = 25%). 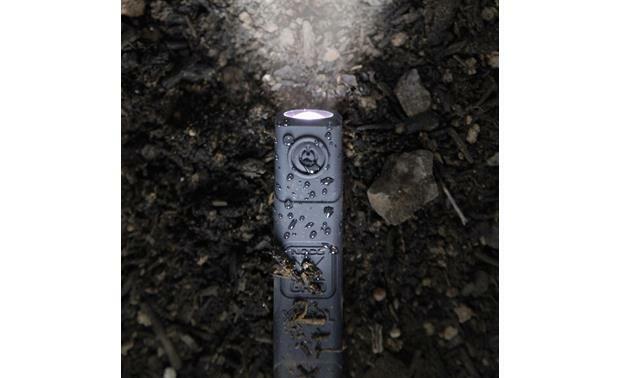 Glow Light: Noco XGrid XGB12's Glow Light is a low-current, LED light that provides low-light during nighttime conditions for reading, or locating the USB ports. The Glow Light is not designed to be a flashlight replacement. 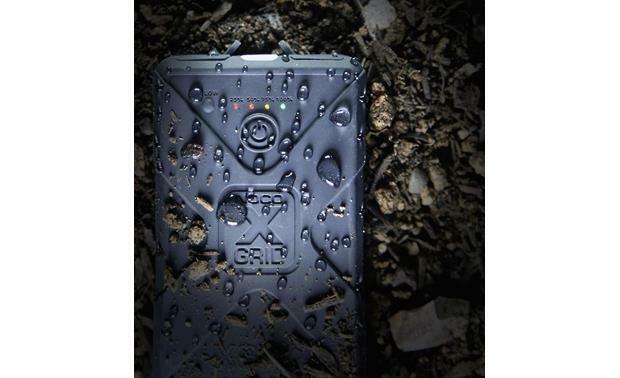 Rugged & Waterproof (IP65): The Noco XGrid XGB12's impact and water resistant (IP65) rubberized outer layer shields the portable charger from water, dirt, dust and other elements. Compact & Lightweight: The Noco XGrid XGB12 measures only 3.25" (w) x 5.25" (h) x 1.1875" (d), and weighs less than a pound. 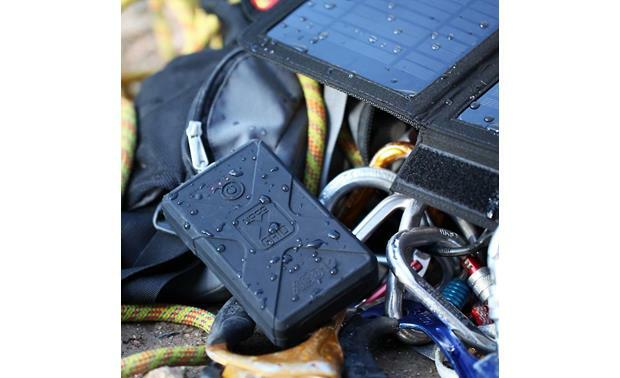 Searches related to the NOCO XGrid XGB12 12,000mAh waterproof portable charger.